Almost all the scientific work today was canceled as 40-knot winds buffeted the Palmer and seas pitched the ship forward and back. Not good weather for dangling a 750-pound, $100,000 instrument like a CTD rosette over the side. On land, bad weather can disrupt a science plan, but only in the ocean can the very surface rise up and toss you around. 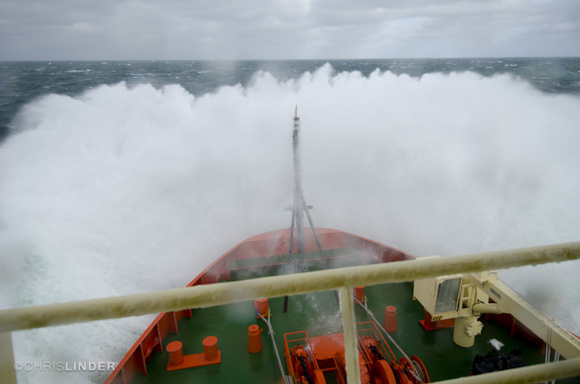 To give you an idea what I mean, here’s a photo from the bridge of the bow plunging through a storm wave. In about 1 second, the spray will hit the bridge windows—60 feet above the water. Many scientists spent the time preparing data plots and then discussing what they meant. Others worked quietly in the Aft Dry Lab taking down equipment they’ve finished with or filling out shipping forms for sending gear back home. This expedition is winding down: we’re due back in to McMurdo early on Feb. 16th, and we’ll begin steaming there on the 14th. Chris and I took the opportunity to head down to the engine room, where we met Chief Engineer Dave Munroe and Engineer Johnny ‘J.P.’ Pierce. They’ve been working on the Palmer since the day it first sailed, in 1992, and they’re proud of their engine room, though they don’t come right out and say so. On the tour we found out how the ship generates electricity, drives its propellers, makes drinking water, and handles its wastewater. In the accompanying time-lapse you can see where they led us—down into a two-level warren of pipes, vents, fans, towering engines, oversized toolboxes, hatchways, pressure valves, and circuit boxes. The whole space is freshly painted—though what I took to be charming interior design turned out to be color-coding to indicate what’s in each pipe. It makes troubleshooting a lot easier, Dave said, as he listed them off on his fingers: blue for freshwater, orange for saltwater, yellow for fuel, black for bilge (wastewater), green for air, and gray for hydraulics. What the time-lapse can’t tell you is the way the engine room sounds and smells. Even with our yellow ear-protection headsets on, I could feel the engines rumbling through my skull, and the whine of spinning parts vibrated my teeth. When 2nd Engineer Richard Johnson leaned over to yell something in my ear, I still couldn’t hear him. 00:00 Scientists are conferring over some exciting new silica measurements from Pennell Bank. From left: Menglei Chu, Ashley New, Dr. Adam Kustka, Dr. Phoebe Lam, Dr. Chris Measures, Dr. Josh Kohut. 00:05 I’m zigzagging down the hall (at one point bouncing off the wall) as the ship rolls in the storm. 00:10 In the control room we meet J.P. and Dave, whose nickname on the ship is Gandalf. We put on headsets to save our ears. 00:23 We’re on the upper floor, where generators make the ship’s electricity to power lights, computers, instruments, and tools. 00:25 The four big yellow machines are generators with 12 cylinders that can produce 4,200 kilowatts total. Typically the ship runs on two generators at a time, keeping two in reserve. 00:27 Dave heads down to show us the engines and driveshafts. At the bottom of the stairs, we’re about 16 feet below the surface of the water. 00:35 It feels hot down here, but the engineers love that the Palmer spends its time in Antarctic waters. That keeps the temperature down to about 80°F compared to 120°F on other ships. On those, ‘even the handrails will burn you,’ Richard told me. 00:40 JP is working on one of the ship’s fuel centrifuges. These machines spin the fuel to separate out any contaminants that might have found their way into the ship’s giant fuel tanks. 00:44 The big chrome covers are the ship’s water distillation system. They provide up to 5,000 gallons of freshwater to the ship each day for drinking, bathing, cooking, and scientific work. They use engine heat to evaporate seawater, then condense the freshwater and collect it. The freshwater passes through 42 carbon filters and 5 ultraviolet lights to purify it before going into a storage tank. 00:46 Oiler Ogie Pagdanganan walks past. The engine room is staffed 24 hours per day, typically with 2 or 3 workers. 00:52 The Palmer’s four immense engines provide the ship with about 13,000 horsepower. ‘Oh, we can always use more horsepower,’ Dave said, ‘But this is enough. In heavy seas, or ice, it’s a good feeling to know you can handle it.’ The ship runs on two engines except when it’s breaking ice. On a normal day it may burn 6,000 gallons of fuel, and up to 14,000 gallons in heavy ice. 00:54 The big metal cylinder is one of the ship’s two driveshafts. The yellow guardrails are there to make sure no one gets in their way. 1:05 Farther along, the shiny metal driveshafts are painted black and yellow. They turn the ship’s two 13-foot-diameter propellers. The port and starboard propellers spin in opposite directions, and the yellow stripes remind people which way each is rotating. 1:19 A bank of dials on each engine keeps track of operating temperature, pressure, and other engine conditions. This engine was running at 210°F, and I could feel the heat through my shirt as I walked past. 1:22 Engineer Jerry Lakarnafeaux walks past. 1:30 Dave grabs a bucket of oily rags for cleaning. The engine room has its own laundry so that their clothes don’t leave grimy residues in the ship’s main washing machines and wind up on everyone else’s clothes. 1:40 Back in the control room, Dave shows us some of the places we just visited, and we leave him to get back to his walnut praline, fresh from the galley.